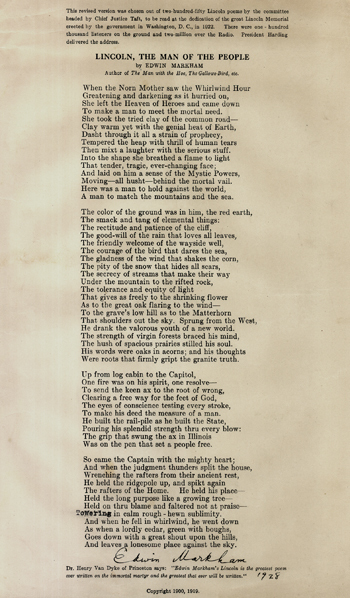 "Lincoln, the Man of the People"
In 1899, Markam claimed nationwide popularity with his poem "The Man with the Hoe." He published "Lincoln and Other Poems" in 1901 where "Lincoln, The Man of the People" appeared. President Taft invited Edwin Markham to read this poem at the dedication of the Lincoln Memorial on May 30, 1922. Markam was named as one the most important artists of his time at a party for his eightieth birthday, where President Herbert Hoover was present. The youngest of ten children in his family, Markam grew up as a "farm boy" in California but by the time of his death, he had more than 15,000 volumes in his personal library. Many schools in several states were named after him, honoring his career as a teacher.